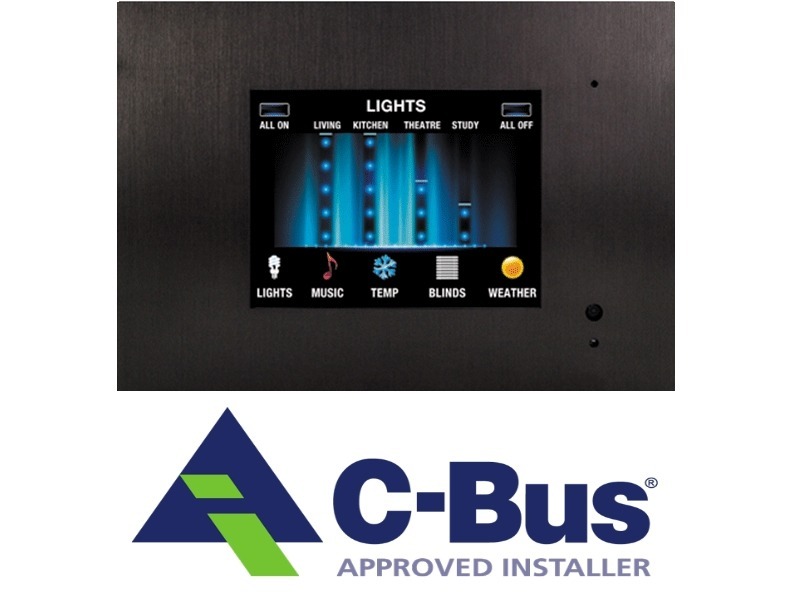 C-BUS Integrated System for the home or office. C-Bus is a microprocessor-based control and management system for buildings and homes. It is used to control lighting and other electrical services such as pumps, audio visual devices and motors. Whether its a simple on/off control of a lighting circuit, or a variable (analogue) type of control, such as electronic dimmable fluorescent ballasts, C-Bus can be used to easily control virtually any type of electrical load. To ensure fast and reliable operation, each C-Bus device has its own in-built microprocessor and intelligence, allowing units to be individually programmed. C-Bus uses a patented method for updating the status of units. This method does not require a central computer or central controller to handle databases or lookup tables to operate. The status of each C-Bus unit is initiated at specific time intervals, without the need of a central controller. Each device is allocated a specific time frame to broadcast its status, synchronised by a self-generated system clock pulse. This allows large amounts of data to be transmitted in a very small time frame, effectively and reliably on the network, leading to low processing overheads and low bandwidth requirements. The C-Bus network bus is the communications wiring for the system, consisting of an unshielded twisted pair (UTP) ‘Cat 5′ cable. The Bus not only provides the means of communication between units, but also the small amount of power needed to operate the circuitry within each C-Bus unit. The C-Bus network is electrically isolated from the mains power and operates at safe extra low voltage levels (36 V dc). Legal restrictions of mains wiring do not apply, so C-Bus wiring may be run into places that would be dangerous (or illegal) with normal mains wiring. All input and output devices are wired to any point in the C-Bus network by a twisted pair cable, which carries all communications between each unit. During commissioning, the system is programmed so that specific commands trigger specific responses in one (or more) devices on the network. At any time the commands can be re-programmed, and C-Bus units can also be added, removed or moved. The size of a C-Bus network is practically unlimited. A large network is usually divided into sub-networks of 100 C-Bus Units, with a total cable length of 1000m per sub-network. This allows a C-Bus system to be divided into manageable sections, simplifying design, limiting potential fault propagation and aiding in any troubleshooting. All units on the C-Bus network have their own built-in microprocessor, allowing them to operate independently with “distributed intelligence”. This provides extremely reliable and efficient communications, and also means that a malfunction in one unit will not affect the operation of any other unit or the network. Every C-Bus unit has a unique number, so that all devices on the network can communicate directly. Also, as C-Bus uses point to multi-point communication, every device on a C-Bus network issues and responds to commands directly from the network, rather than relying on a central computer or controller. Each C-Bus device is programmed to issue and respond to the certain commands. A virtually unlimited number of commands can be programmed into the C-Bus system. Generally, input devices are programmed to issue commands, and output devices are programmed to execute those commands. When a C-Bus group address command is issued by a C-Bus device, any other devices that have been programmed with that group address will be activated. There is no need for any direct 240V connection between any C-Bus units. Single devices can also produce multiple events. For example, you may program an input switch so that the length of time the key is pressed determines what command is issued – a short press issues an on/off command and a long press controls a dimming command. Multiple commands do not have to control the same output device, so complex scenarios can be easily created; for example a single push button switch controlling a whole floor of a building. Multiple input devices can conditionally control a single output device, defendant on specific circumstances. This allows multiple levels of over-ride switching and other complex control systems to be created easily. Any input device can be programmed as a master control point. Master overrides can be positioned anywhere in the network, and control any other unit or units on any connected network. The system can allow unlimited switching configurations. Two, three (or any number) of switches can be set to toggle or control any other switch or device. Overrides can be easily re-programmed via Windows software at any time. A computer or central controller is not required for normal C-Bus operation, but can be used to add additional features if desired. For example, an input switch in the boardroom is programmed with the C-Bus Group Address ‘Boardroom Main Lights’. When the switch is pressed, it issues an on Command to the ‘Boardroom Main Lights’ C-Bus group address. This group address command from the input switch is sent onto the C-Bus network for all units throughout the network. Only those C-Bus units programmed to respond to the ‘Boardroom Main Lights’ group address command react, other units will ignore commands not intended for them. This simple example only gives you an overview of the power and control flexibility of the C-Bus system. Devices that control mains power also need a connection to the mains, of course. The mains wiring and C-Bus wiring do not need to be adjacent, and the mains can be connected to different phases, or even completely separate distribution systems. Call us on 1300 349 835 or contact us online to speak to a Fixtel Customer Solutions Adviser today about C-BUS integrated systems for your business.